Posted on August 17, 2011 by Curt O. 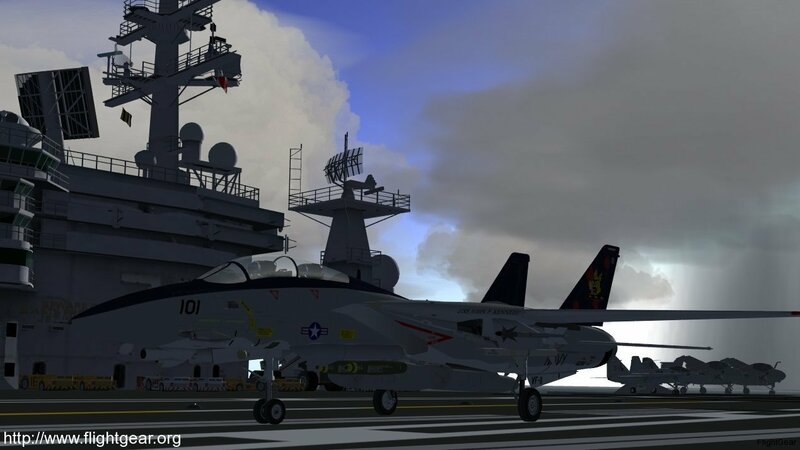 The FlightGear development team is proud to announce the release of version 2.4.0 of its free open source flight simulation program. FlightGear 2.4.0 reflects over one and a half years of development and incorporates several new and exciting features, as well as numerous bug fixes. One of the hallmark features of this new FlightGear version consists of a completely overhauled weather module. While it was previously already possible to load realistic weather by downloading (or creating custom) METAR weather reports, the current FlightGear 2.4.0 version takes weather generation an order of a magnitude further by applying the laws of physics to the reported conditions and by determining how the atmosphere interacts with the terrain. This results not only in customizable weather, but also in all the exciting phenomena that occur at the boundaries between different weather systems. Among the numerous phenomena included in the weather simulation are fog layers that are limited in altitude, cold fronts, thermals, cloud formation in updraft winds along mountain ridges, and many, many more. In FlightGear 2.4.0 checking the weather is no longer a luxury option, it is essential for flight safety. Adding to the improved visual experience, FlightGear 2.4.0 introduces numerous graphical enhancements. 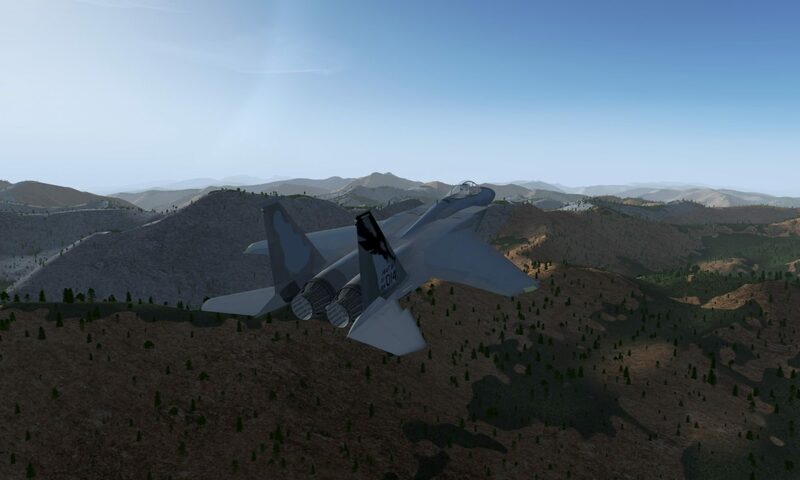 By employing state-of-art computer graphic techniques, FlightGear 2.4.0 is capable of rendering highly realistic mountain surfaces, 3-dimensional cityscapes, or shiny metallic surfaces. Through the application of these new computer graphics, water moves realistically and sunlight is reflected from its surface. Many new aircraft models are so realistic and detailed it is almost possible to see oneself reflected in their hull. If that isn’t enough, FlightGear 2.4.0 can draw a full 3D image, through one of the many stereoscopic rendering options. FlightGear’s user experience is also enhanced through several improvements to the software. New and extended autopilot controllers have resulted in a dramatic improvement in autopilot stability in many aircraft. 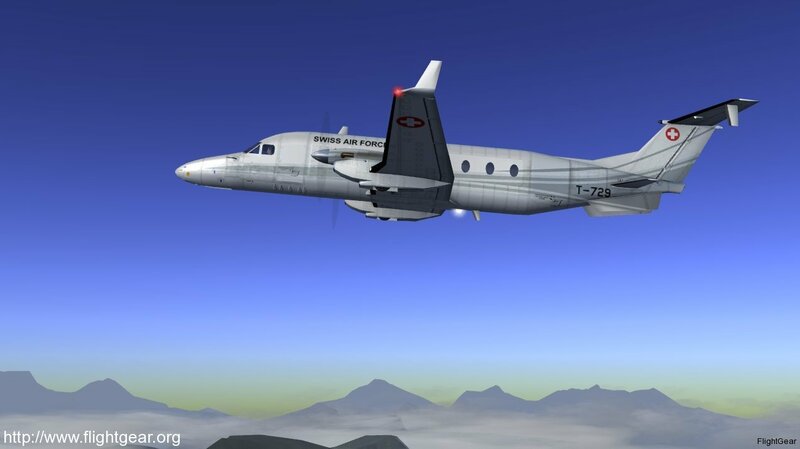 Additional cockpit systems such as TCAS, and EICAS systems –as well as other realistic aircraft reactions to the environment– provide unique new challenges and opportunities. And if these systems still can’t prevent one from getting lost, it’s always possible to pull up a moving map, or use the new and improved heads up displays. Under the surface, FlightGear 2.4.0 also introduces several innovations. A brand new experimental HLA interface layer allows for real time communication between several independently operating modules, either running on a single computer, or on a cluster of networked machines. Eventually, HLA allows for a complete modularization of FlightGear, and its integration with professional high-end flight simulator hard- and software components. Finally, FlightGear 2.4.0 has a built-in option to keep its scenery up to date and download new scenery areas on the fly. While this was already possible by using an external program, this feature is now incorporated in FlightGear itself. The many new and updated scene models all around the world will keep one busy exploring the world of FlightGear. With a choice of nearly 500 different aircraft, from historical to bleeding edge, from ultra-lights to the ultimate flying heavy metal, there is something to cater to each one’s taste. In FlightGear 2.4.0 it’s no longer the sky that is the limit; it’s the imagination. Updates to the KLN89 GPS. Tankers now refuel with any callsign, and can enable/disable refueling in flight. More communication / interaction between AI aircraft and ground. Support for multiple frequencies for AI/ATC interaction. Head over to the FlightGear Download Page to get started! Hi, I am new to flight gear, I know that what I am about to say is related to Tech Support which should be done in forum, but, somehow, while registering, I managed to get my verification code wrong, and I ended up being blacklisted. The problem is that in the overview of Version 2.4.0 release it is stated, ” water moves realistically and sunlight is reflected from its surface”, but what I got is a solid blue area, with no moving of water, and, of-course no reflection. Did I messed something or what? Secondly, I’ve been using FS2004 for a long time, and it includes options for display settings, which can be maxed or set according to user PC specifications. Is there any option like that in FGFS? Thirdly, when setting clouds I selected the option overcast, but in game the sky is not overcast (my understanding is that in overcast sky, one can see little or no blue sky). I would be grateful if someone helps me out of these problems. Just easy, if you don’t see water’s shader. you must update your graphic drivers. For display setting you can select in the FGWIZARD your screen resolution and so on. Bilal41: The forum (www.flightgear.org/forums) is usually the best place to seek help. Congratulations to all developers and collaborators. Unfortunatelly, it’s not possible to save a flight. Windows 7, as I saw in a forum. Pingback: Une nouvelle version de FlightGear open source ! | Open source – Le site communautaire youtube des tutoriels jeux videos . . .
I’ve just been looking into flight simulators for a short period and am being overwhelmed at just what is out there. I am impressed with what I have read hear at FG. It seems anyone having problems needs to look at their computer and upgrade drivers before they start putting down FG 2.4.0. Thanks for all the comment everyone they really taught me a lot and have given me a lot of ideas. Non riesco a far partire il mio aereo e in più il gioco è tutto in inglese… AIUTO !! For some reason at the very end of the instal of 2.4 on windows XP I get an error, after closing the error it says installation finished but if I try to start flight gear it says THIS APPLICATION HAS FAILED TO START BECAUSE THE APPLICATION CONFIGURATION IS INCORRECT, RE-INSTALLING IT MAY FIX THIS PROBLEM. I have tried, and it doesn’t. Is this a common problem, and how can it be fixed. Please use easy to understand words, I am not tech savy, just like to fly. Will there be any Mac-optimized versions of FG in the future? I was able to play FG 2.0 mostly smoothly on my computer but 2.4 is really, really laggy for me even at all the lowest quality settings. Have you tried unchecking the materials shader checkbox, even if all the individual shader options are already off? Hi! Great news and thank you very much for this great piece of software! Please fix this really bad bug: in most aircrafts, one engine does not start even in manual startup. In in others, the flaps are staying in a position when i didn’t even move it and its straight. I try to make the flight path straight, but its always isn’t perfect and will just crash if left alone for a while even in autopilot. PS- So most of the aircrafts are always turning in one direction and like i said, will crash if left alone EVEN IN AUTO PILOT. Look for the “Download” in the main menu at the top of this page! As to Reuben’s post on the 64bit overlay, I am also asking, is the 64bit FGRUN Launcher ready or available for this new version 2.4.0. as per the previouse version. i hav a question, why when imgoing to view , rendering options and i selected landmass, textures , urban effect it doesnt works? are there realy helis too?? Yup, we have a quite a nice selection of helicopters. 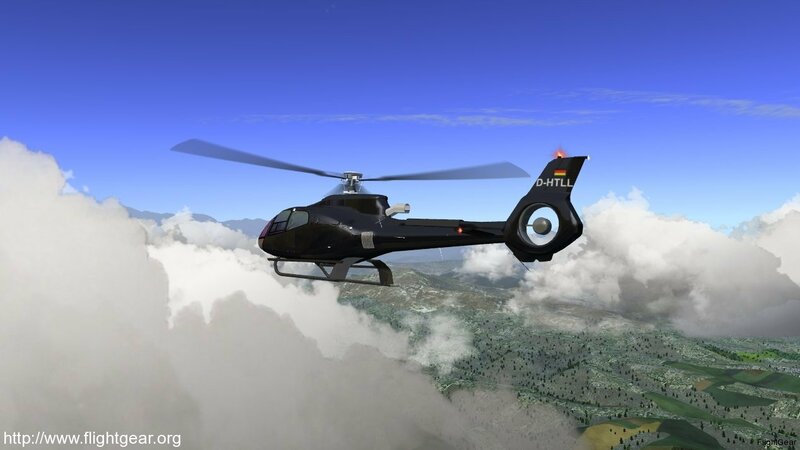 And our helicopter flight dynamics are pretty realistic and capture all the major dynamic effects that you’d expect to have to deal with and react to as a helicopter pilot. Downloaded 2.4.0 Windows version. Can’t install. Just creates the directory and then apparently freezes. Tried both normal donload and torrent – same result. I too was having this issue. Freezing after creating directories. I had been trying to install FG on my H drive. When I finally gave up and accepted the Default of C everything went fine. maybe others are having a similar issue. I have just tried this. defaulting flightgear to drive C AND terrasync to drive C worked. I’d left terrasync to my ooriginal choice but it still froze. Once I defaulted everything to drive C no problems. However I feel that being able to assign any drive is a realistic assumption. Thwere are many installtions that don’t every give you a choice but with bloatee windows, it’s good to put your own programs on a differant drive if possible. Yet another impossible to play FlightGear release. Better looking, slower (even on my 1 Gb Radeon graphics card) and plain impossible to … take off. On your next release, kindly consider a typical newbie and how (on earth) he or she will be able to fly an aircraft, even for a few minutes. For now, FlightGear will remain installed on my hard drive and will hardly ever be used. Too bad. Flying an airplane can be very complicated in real life, and FlightGear intends to be a realistic simulation. My recommendation is to start with a simple plane like the Cessna 172 or the Piper Cub. The wiki is an excellent source of information and well worth visiting and exploring. It takes some time and patience to learn the basics of operating and flying an airplane, and once you have the basics down there is a huge array of other things you can learn and challenge yourself with. Weather, time of day, IFR and VRF navigation, operating a variety of different types of aircraft and helicopters. This isn’t intended to be a “game” where you fire it up and start shooting and blowing things up. The goal is learning and practicing and mimicking the challenges and rewards of real life aviation. If you are having performance issues, I recommend you install the latest graphics drivers for your graphics hardware, and also check out our forum. If you post a detailed explanation of your setup and how you have configured FlightGear, hopefully you can get a number of tips for tuning different FlightGear options to maximize your performance potential. You’re correct, flying is much more than “boring holes in the sky”. However, the complexities of learning to fly do not generally require a degree in computer science or programming. I have tried everything I can think of and have looked at your docs and still cannot get this program to run. No response to my earlier post. Others have posted how dificult this system is and, unfortunately, I must agree. Commercial flight simulators, such as used by the military and airlines, do not require the student to learn how to program that simulator. I suggest you consider the same with your program. All the pix look great. Maybe someday I will actually be able to try it. Oh, lest I forget: trying to Debug > Print rendering statistics freezes the application on my Windows 7 32 bit system. The comments section here is really not designed for doing tech support. I’d recommend asking about these issues on the forum. But one very generic tip which has helped a number of people is to update your graphics drivers to the latest available from your graphics hardware chipset maker (like from ati.com, nvidia.com, etc.) 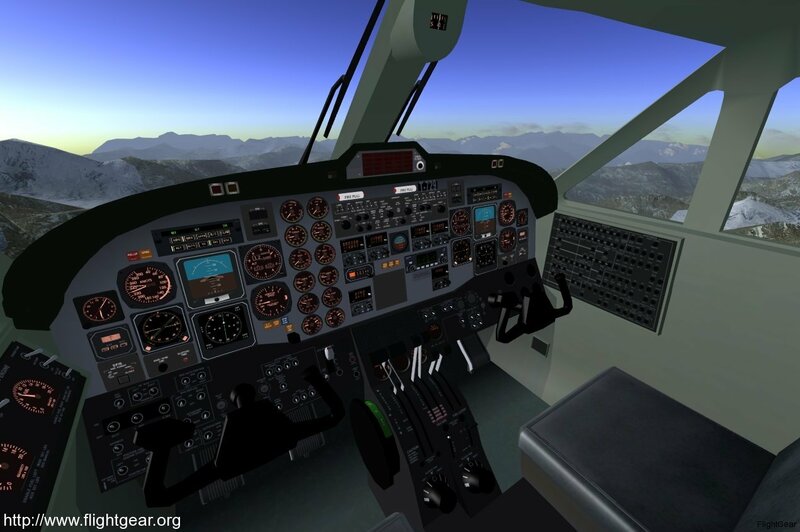 FlightGear is sensitive to your graphics drivers because it uses a lot of advanced graphics featues; and many stock windows installations have older and buggier opengl support. Upgrading the video drivers has been helpful for many people. It’s a shame you feel this way John. I too was an absolute newbie when I first down loaded Flight gear, I still am when you read the posts in the forum – I have no idea what they are talking about most of the time. I think the key was getting a decent joystick and reading a bit about how to use it, not a lot just the basics. Since then I have been able to link to the map server thingy where you can track your flight. Now I am addicted. Please don’t give up, Flight gear is a living example of how ‘what you pay for is what you get’ isn’t always true. I’m not a fanatic I just like flying around. it is great to see the new version available as there was no public visible development in the last months. Now everyone can see what has been done in the background. All the new and improved features sound really great and I’d be happy to test all this on my machine. But unfortunately I cannot find a Linux version of FlightGear yet. Only Win and Mac available. Is this the intention? I hope no. I guess there’s a Linux version in work right now? Will there be a repository for Ubuntu for instance? This would be great too. Anyway! A great job you’ve done, by what I’ve seen so far… thumbs up!!! Aaah! Getdeb.net has finally set up FG 2.4.0 for Ubuntu 11.04! 🙂 All smiles here!!! Brilliant and very appreciable job.Thanks! Congrats, well done! What about binaries for Linux? I’m not really a flying hobbyist but this is the first release I enjoyed playing (e.g nice tutorial). Congrats on the fine release. I have been using the 2.4 release candidate. Is there any need to download the 2.4.0 release? I see you have an IAR80….is there any damage models and weapons modeled for ACM? 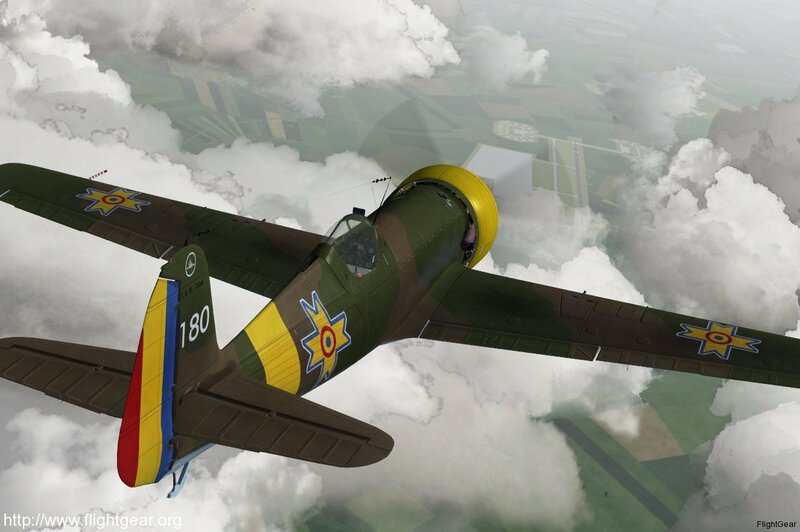 There was an AI & MP Dogfighting project, but not compatible with last version due to lack of updates. We are working on a new v2.4 aircraft download page. Expect something by tomorrow on that. We also plan to work on a new scenery download page, but that might be a week or two out. For now the v1.0.1 scenery should work just fine, or you can get all the latest scenery via terrasync. omg! its so freaking slow! I remember using this simulator in early 2000, back in the earlier days of the project. To see where it has come today it is absolutely unbelievable. This right here goes to show what the result of the hard work and dedication of volunteers is capable of. I used to use Microsoft Flight Simulator a few years back. Just recently I came back to flightgear and downloaded the 2.0 release and the beta 2.4. This simulator is just as good if not better than Microsofts $50 alternative. This project has come so far, the realism, the scenery, the graphics, the 3D cockpits, it is absolutely amazing. Don’t ever let this project die. It has come so far and has so much potential with its open source flexibility, the collaboration of different ideas from people all over the world is the heart of this project. Their are very few projects out there like this. I will enjoy this project for years to come for fun and for training. Saweet! I’m downloading it now. Can’t wait to install it and review it on my site! Watch for the review, guys! Oh, and 1 question – FG 2.4 RC5 kept heating my CPU to over 80C. Why? It’s a i7-720QM. And the nVidia GeForce 230M works with it right? I assume a 64 bit overlay is needed for 64 bit systems, is there one available for 2.4.0? Can’t wait for the Airbus A320!!! I haven’t the news aircraft… Why ? We are working on building the new aircraft packages and the new download index page. Look for these to show up in a day or two. Okay. Thinks for this job !!! Special Thanks to Curt for a new, much better Homepage- this really shows that this project is alive and is getting better and better! Finally, I’ve been waiting for this version officially released.